AUI().ready(fn): Executed after the HTML in the page has finished loading (minus any portlets loaded via AJAX). 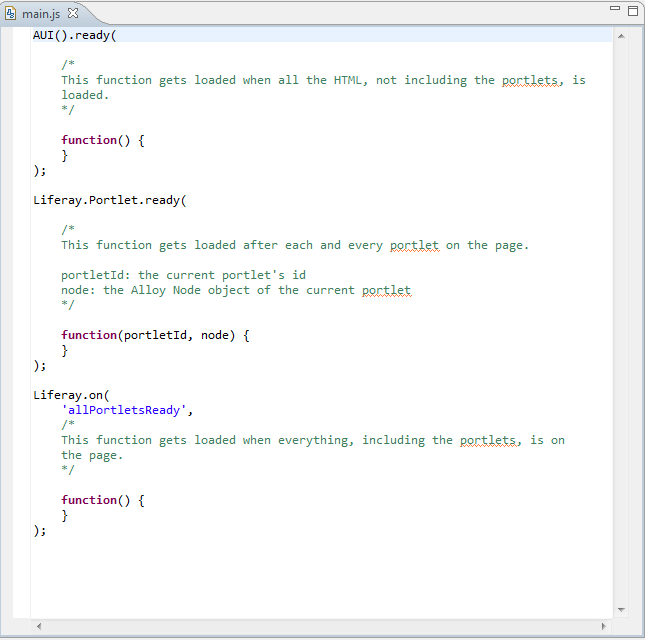 Liferay.Portlet.ready(fn): Executed after each portlet on the page has loaded. The callback receives two parameters: portletId and node. portletId is the ID of the portlet that was just loaded. node is the Alloy Node object of the same portlet. Liferay.on(‘allPortletsReady’, fn): Executed after everything else (including AJAX portlets) has finished loading. Now let’s make your theme configurable by defining settings.